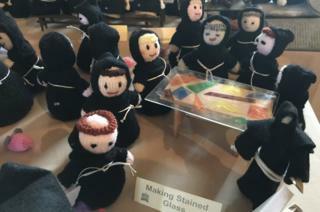 Over 800 knitted monks, created to celebrate Tewkesbury Abbey's upcoming 900th anniversary, have gone on show. The creations, depicting monks carrying out various activities, are on display behind the abbey's altar. Organisers want a further 100 to be knitted, to make a total of 900, ready for anniversary celebrations in 2021. The abbey was consecrated in 1121, and was home to a community of Benedictine monks until the dissolution of the monasteries during Henry VIII's reign. The Reverend Canon Paul Williams said people had been "knitting like mad" for the past few years. "We're trying to knit 900 monks for 900 years. In the next two years we've got to get about another 100 in. "We should be able to do it because people are knitting them all over the country and sending them to us. It's amazing." He said monks had played an important part of the abbey's history. "Originally a group of Benedictine monks founded the abbey... so monks were worshipping and working here for over 400 years. "This is just a way which we thought could represent that." The current display will end on 10 March.